Ready for the off: Achill will host the Mayo Stages Rally later this month. 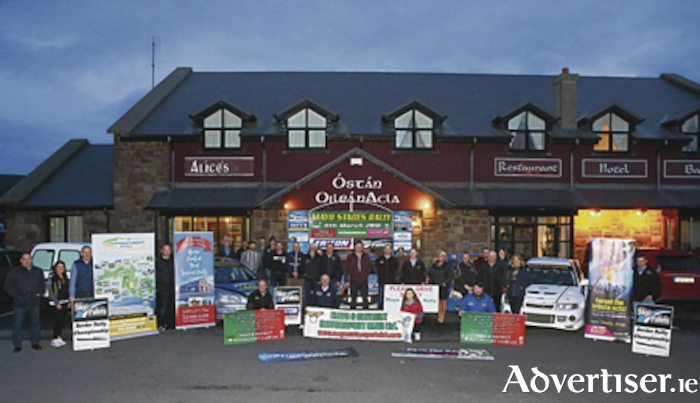 There was great excitement as Mayo and District Motorsport Club gathered in Óstán Oileán Acla for the launch of the Óstán Oileán Acla/Connacht Print and Signs Mayo Stages Rally 2018. Locals and sponsors got a preview of what’s in store on rally weekend as they inspected a fine array of rally cars on display in the car park for the launch. e welcomed all the sponsors and had a special welcome for Andrew Mullen, managing director of Sligo Pallets who travelled from Sligo for the evening. Trevor thanked Cathal McLoughlin and his staff in the Óstán Oileán Acla for all their assistance and support in the lead up to the event, and also thanked joint title sponsor, David Devers, from Connacht Print and Signs for his ongoing support of the Mayo Stages Rally. This year in addition to being the opening round of the Sligo Pallets Border Rally Championship, the Mayo Stages Rally is also the opening round of the Triton Showers National Rally Championship and this will attract some of the bigger cars from around the country and overseas. Trevor thanked Brendan Flynn from the Border Championship, Aidan Kelly, chairman of the National Rally Championship and Kevin Barrett, Triton Showers for all their support. Also in attendance at the launch were Sean Molloy of Achill Tourism who joined with local County Councillor Paul McNamara in welcoming the event back to Achill for the second year running. Trevor thanked An Garda Síochána and Mayo County Council, in particular Gerry McDonnell and Councillor Paul McNamara who have been very helpful. Trevor explained that the final touches are being put in place to ensure the rally runs as smoothly as possible and that it will be a weekend to remember for the competing crews, spectators, sponsors and most importantly the local residents who have been so accommodating and welcoming to all. He added that without local support and sponsorship, it would not be possible to run the Mayo Stages Rally and he thanked everyone who has come on board – sponsors of service area, marshal meeting points, programme sponsors, stage and scrutiny sponsors. Wrapping up the formalities Trevor thanked his team for all their support and hard work and said they were all looking forward to the big event.